So you have a variety of box sizes to ship and are looking for a way to automatically print and apply labels without breaking the bank? Well, now there is a solution. Weber's economical LA-2050 label printer-applicators offer maximum performance in a small compact footprint, using a highly-efficient low-energy tamp-blow applicator for contactless labeling. Label placement accuracy is ±0.05 inches. 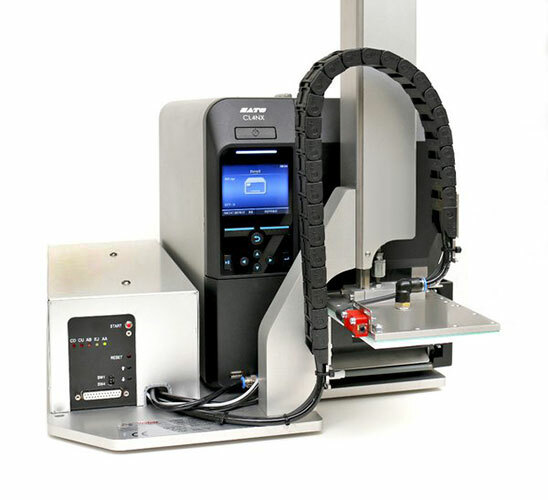 The LA-2050 uses a Sato CLNX thermal-transfer label printer (203, 300 or 600 dpi) that can print thermal-transfer or direct thermal labels as small as 1.1” x 1.5” and up to 4.7” x 6.2” (ideal for 4”x 6” shipping labels). The LA-2050 print apply systems handle larger label rolls than normal, with an outer diameter of 8.60”, that allow you to apply an average of 20 percent more labels between roll change over. Likewise, the longer thermal transfer ribbon footage of 1,968’ allows for continuous label printing over a longer timeframe. And when the ribbon or labels need to be changed, it can be accomplished quickly due to the design and ease of access to the printer mechanism.